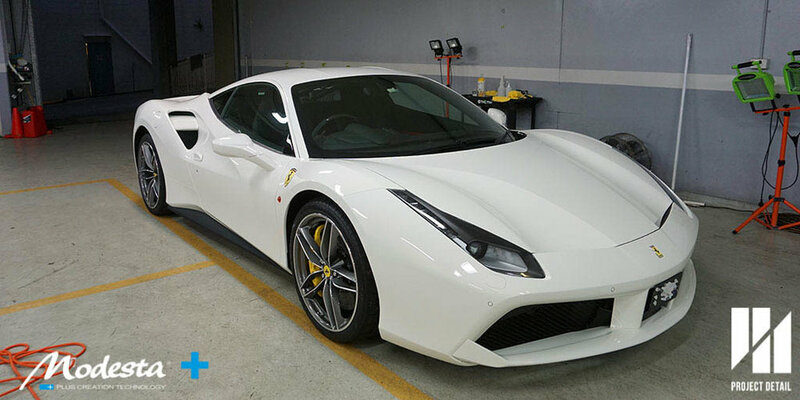 Ferrari 488 GTB in Avus Bianco protected with Modesta BC-04 Nano Titanium Glass Coating. The Ferrari 488 GTB made shockwaves upon its release in 2016, succeeding the iconic 458 Italian and the even rarer 458 Speciale. The looks and the performance of the 488 GTB were striking and otherworldly, boasting impressive performance figures to boot. One of the biggest concerns was the use of a smaller engine with two turbo chargers versus the older naturally aspirated V8 engine in the 458 Italia and Speciale but as many owners and reviewers found out Ferrari didn't disappoint. The 488 GTB's exterior is incredibly bold, taking cues from the older 458 models and trimming away and refining the overall looks to something aggressive and even sleeker. What we found interesting was the level of detail and time that the individual owner had taken in designing and optioning the car versus another 488 for example; small badges, colour or interior differences and even down to the carpet matts. The interior was incredible in another sense. For a supercar, the 488 was almost unbelievably easy to get in and out of. Furthermore the seats were very comfortable and best of the all the fitment and quality had surpassed the Ferrari's of yesteryear. 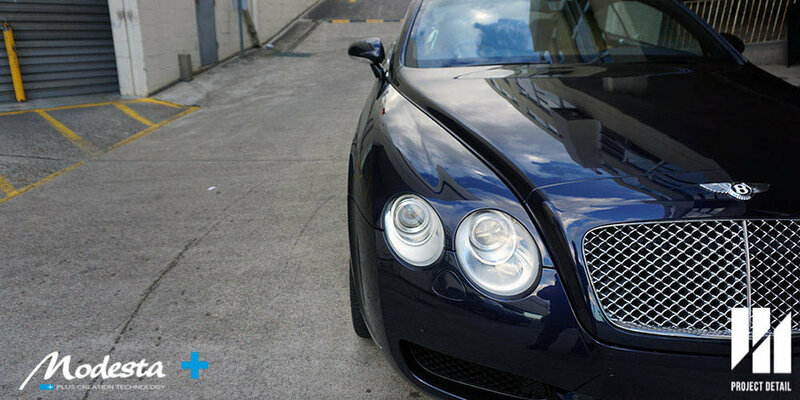 Project Detail is a premium detailing studio in North Rocks, Sydney which focusses on delivering bespoke protection services for owners that care for their vehicles. 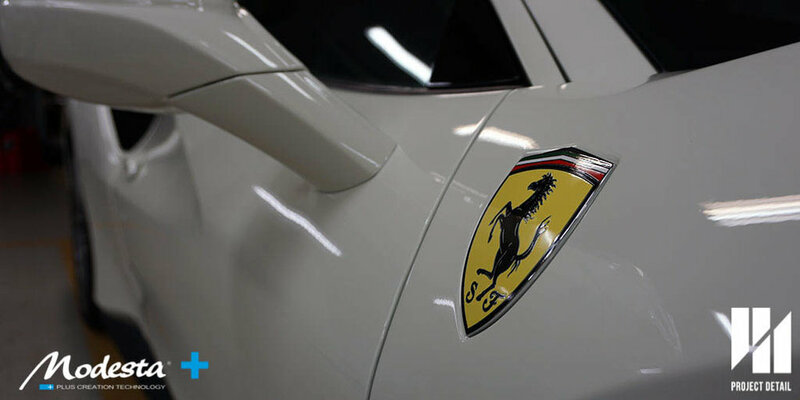 We were fortunate enough to be able to work and provide our services for this Ferrari, choosing Modesta BC-04 for the solid white while maintaining a harder and more scratch resistant glass coating. We use a pH neutral citrus based 'pre-wash' solution to soak the vehicle before washing starts. When washing a vehicle of this calibre but also for any vehicle, proper techniques make or break how good the overall finish will be. Many detailers often overlook just how much difference just a 'good' wash can make. 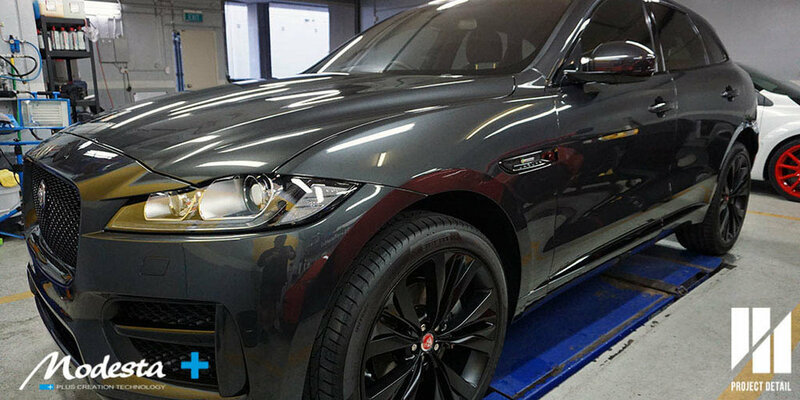 Project Detail utilises a standardised '21 Stage Wash Method' which contains many fail-safes and components which assist in removing as much dirt and debris from the vehicle's surface even before our wash mitts touch the surface. We also utilise hot water between 30-90 degrees in remove and clean the car to another level. Another core component of our '21 Wash Method' is the hot foam bath. By taking the time to remove all loose dirt prior to a physical wash, the paint's condition will have the best chance of scratch/swirl free. 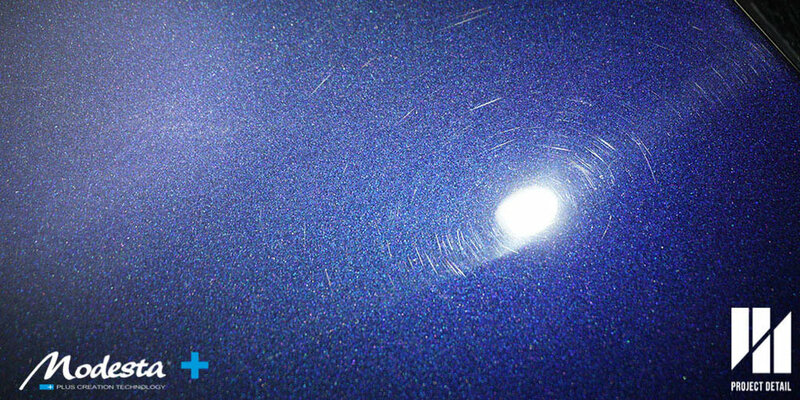 Light physical defects are caused by friction and the grinding of grit against the surface of the paintwork. If done properly and regularly, by the time the multi-bucket wash and mitts do touch the surface, there shouldn't be any dirt on the car. 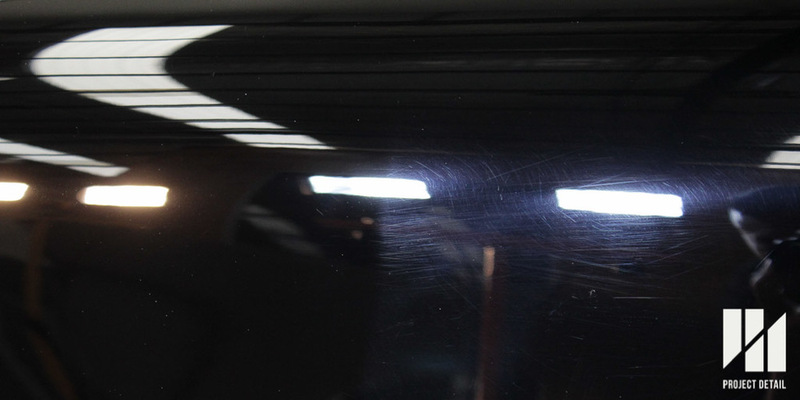 By installing a good glass coating system like Modesta, this process then becomes even easier. Once the car is washed properly, only then can we begin the 'decontamination' process. This involves the removal of items embedded into the paintwork that cannot be normally be removed easily by the above mentioned washing techniques. 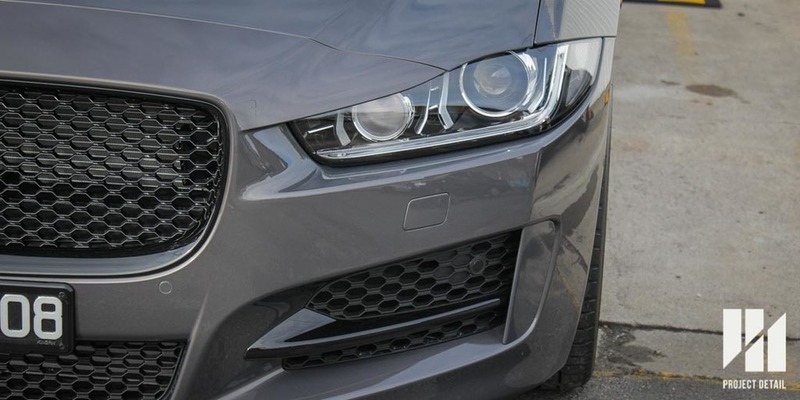 These can include but are not limited to: iron fallout from brake dust and carbon build up, tree sap, other dirt and contamination and pollution, overspray from the general environment. 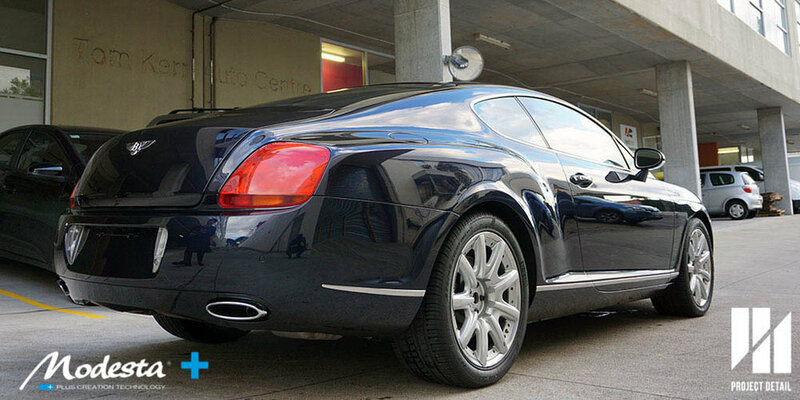 Traditionally these are removed through the usage of a Clay Bar but modern detailing methods also have chemicals which can dissolve or soften the contamination to be removed safely without scratching the paintwork. The slide show shows the car on a hoist with the wheels removed. 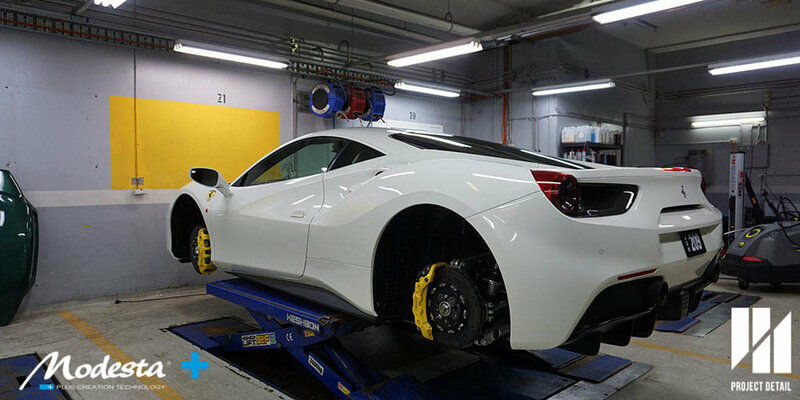 This allows us to perform a deeper clean of the wheels arches and inspect underneath the Ferrari as well as having a closer look under our lighting. Closer inspection revealed that all 4 Calipers were worn from the dealership. Project Detail has specialised equipment to be able to polish even the smallest areas. One of the things we noticed on this 488, all 4four Yellow optioned brake calipers were all scuffed and this could not be removed with solvents, rubbing alcohol or polished by hand. We used our Rupes TA-50 Air Polisher (also Italian made) with a custom made Microfibre pad and some Modesta C-02 Compound to polish each brake individually. This not only removed the scuff mark but made the brakes deeper and glossier ready for coating. 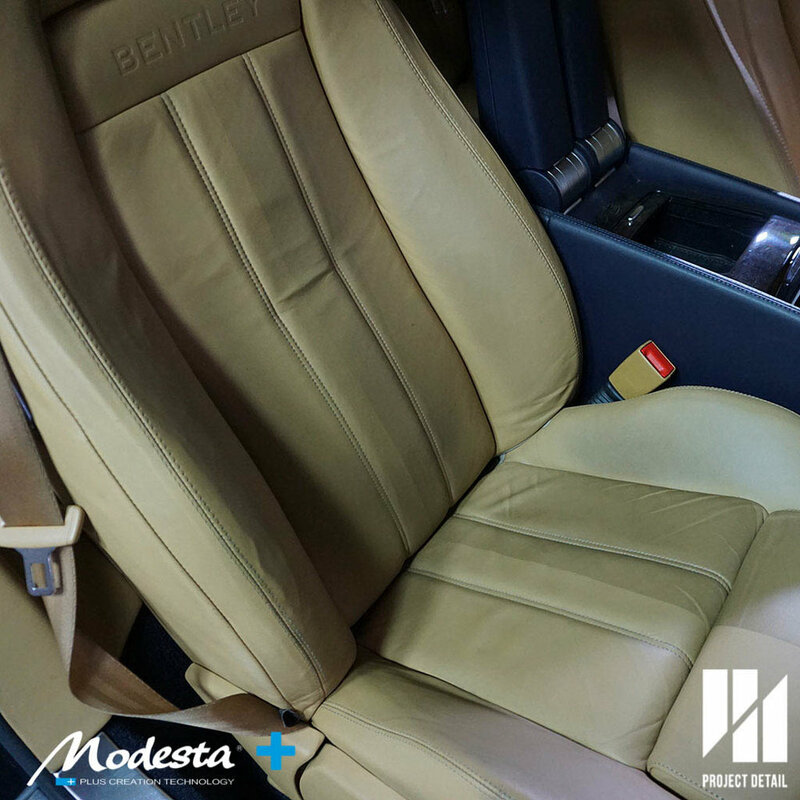 Modesta BC-06 is a heat and physically resistant coating designed for durability. Applied to wheels & brakes then IR cured for maximum strength and longevity. 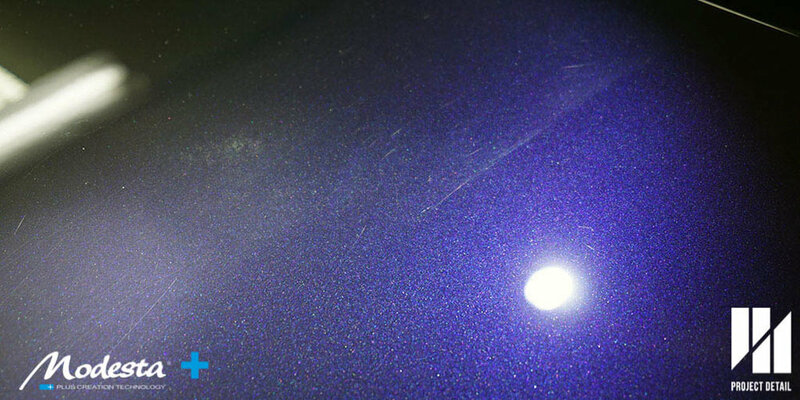 Once the deeper cleaner and the car has been prepared, the paintwork will undergo paint correction, allowing the paintwork to be truly clean and defect free before we proceed to priming and coating the car. Hand made in small batches, Modesta produces truly incomparable products. 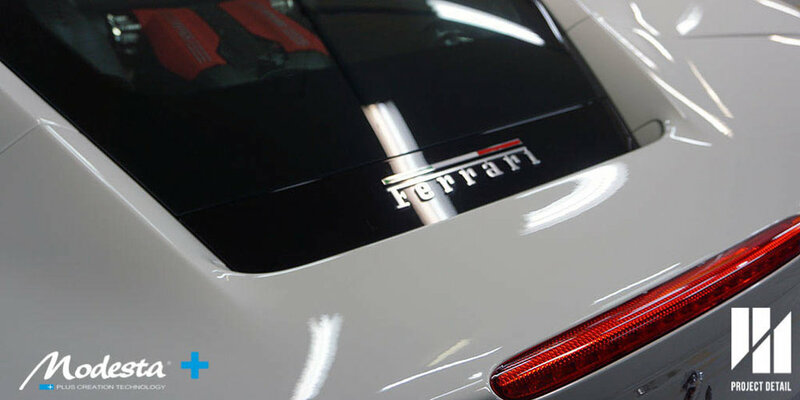 In order to get the best gloss from the Solid White colour while giving a superior hardness and scratch resistance, the owner opted for BC-04 Nano-Titanium Glass Coating. Containing high grade titanium oxide, BC-04 is a hydrophillic coating, installed under wet conditions. Being a hydrophillic coating, the water bead contact angle is much lower then many hydrophobic coatings but is also more readily able to sheet the water from the surface while also being more resistant to water spotting which can be considered the weakness for many hydrophobic coatings on the market. Modesta BC-04 being installed under 'wet' conditions. Like all Modesta coatings, BC-04 is no different requiring an application of P-01A Primer before hand to give a thick base of special Alkyd Resin for the coating to form a strong bond to give a longer lifespan and increased thickness. After application, infrared curing is required for the coating to reach full strength. 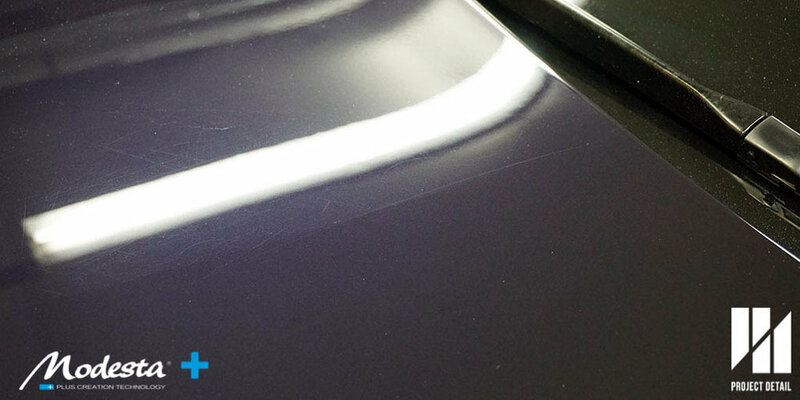 Due to the thickness of Modesta's coatings without infrared curing the coating would take much too long to cure properly and also fail to reach full strength and potentially failing early. 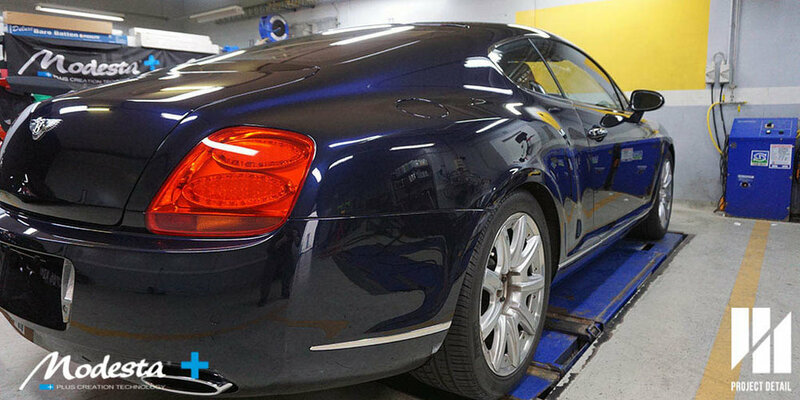 Each panel of the vehicle undergoes the laborious process of infrared curing increasing the strength and lifespan of the coating. After days of work, the Ferrari 488 GTB is full coated and protected with an exclusive protection, Modesta by Project Detail. 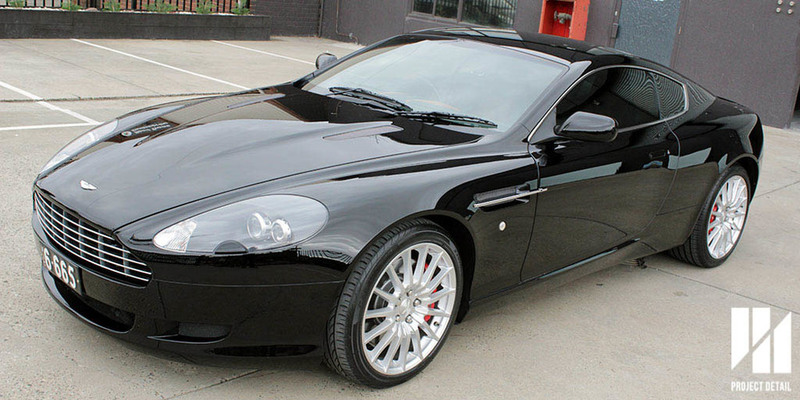 The gallery below showcases some of the finishing shots, note the bright and crispness of the paintwork which contrasts how glossy and deep the gloss black, carbon fibre and even the wheels. Ferrari has truly outdone their efforts in the 458 with the new 488 series. 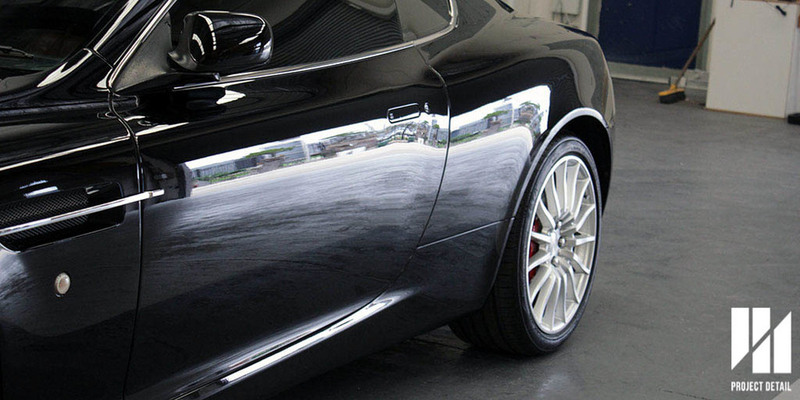 Project Detail has aimed to detail and preserve the finish as befitting a vehicle of this calibre for years to come.